MaxiComp : are for 1,500 tonnes/year to over 50,000 t/yr. Maxi-Aergestors maximize the payload on 32 tonne RollOnOff truck or may be built for ISO container handling equipment if a compact footprint is the priority. 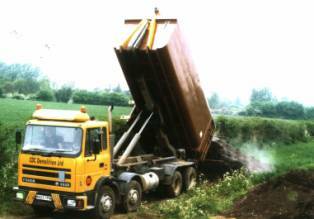 MidiComp : suits throughputs from about 300 to 2000 t/yr with Midi-Aergestors designed for Skip lorries or small RollOnOff vehicles. MiniComp : could be built for smaller amounts using a light tractor with front-loading arms for the container handling. MBT & AD : these composting systems can provide the main biological step in an MBT or BMT plant or compost the digestate from an Anaerobic Digestion plant to make it fit for use. Optimum plant sizing to serve a community avoids focussing heavy traffic in and out as per big plants. Full enclosure of all smells and aerosols, subdued noise, no 'bleeping' from shuttling mechanical shovels, and low visual profile makes for cooperative neighbours. Total thermal insulation ensures sanitization as per ABPR whatever the weather so no unscheduled stoppages. Compost production rather than waste disposal for a healthy image vs. NIMBYs & BANANAs. Modularity allows plants to start small and expand competitively. Aergestors can be reallocated between from Stage 1, Stage 2 and MBT and systems can be relocated. Site layouts can fit in with most constraints like existing buildings and sloping land. Reception & loading at one site with Stages 1 and/or 2 elsewhere for possible economies. Computer control allows temperatures, times and phases to be amended as regulations evolve. Up to ten Aergestors share one Aerator for energy efficiency and to recover HEAT that may be more valuable than the compost. Aergestors being both reactors and transport containers eliminate double handling; RoRos and skip lorries can reach and tip where bulk carriers dare not venture. Hybrid aeration with active control minimizes retention time so maximises throughput. 'Fill and forget' with modern data handling economises on management, labour and fuel. Satellite facilities for proximity can be networked to give economies of scale. Lease easily obtained as whole system is demountable.